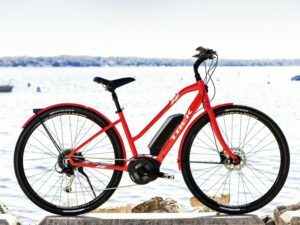 E-Bikes are here, and here to stay! Luckily for you (and us), Trek has created an awesome line of E-Bikes. Do you love mountain biking and wish you could ride steeper, tougher terrain for longer? There is a great option for you! Is your commute a little too long to do every day by bike? There’s a bike that can help you ride in to work all week! Do you want to extend your rides further than ever before? 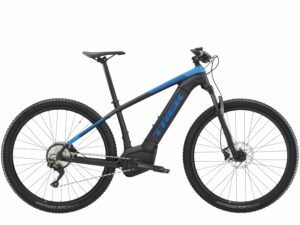 E-Bikes are a great option to look at! 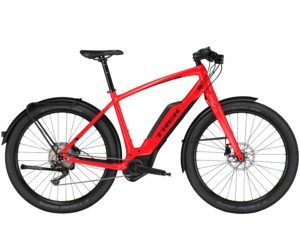 All of Trek’s E-Bikes use super reliable and simple Bosch motor and battery. We are very excited to carry these bikes, as they have proven themselves to really hold up over time and be easily serviceable, something that has been a real issue with many other E-Bikes. All of our options are pedal assist, so there are no throttles in sight! The pedal assist is so smooth and strong they’ll make you feel like a superhero every time you hop on your bike! These are bikes you’ve really got to ride to get the true feel of, and we’ll always have some available for a test ride! Come in anytime and take one out! Here are the ones we like! Click on the image to see more information! One of our most popular bikes now comes with pedal assist! What makes the Verve+ a great E-Bike is that it puts you in a comfortable, upright position so that you can easily look around and enjoy your scenery, while also giving you the capacity to extend your ride, and maybe throw in a grocery trip on the way. Included fenders keep you dry in the rain and disc brakes stop you reliably in all conditions. We’ll always have a size run of these on the floor! (Until Trek runs out of them;) <-That parenthesis IS doing double duty. 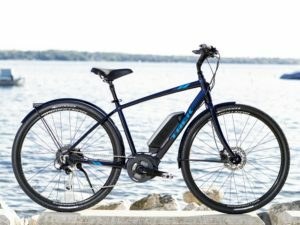 The Super Commuter+ from Trek is the E-Bike to get if you want to add some serious speed and fun to your commute! With integrated lights, fenders, and rear rack, this bike is ready for any duties you can throw at it. The Super Commuter+ 8S’ pedal assist takes you all the way to 28 miles per hour, so you’ll be beating traffic! Trek’s Powerfly 5 is truly a do everything bike. Do you want a commuter that can handle snow, dirt roads, and singletrack? Are you interested in extending your mountain bike rides? The Powerfly can do all of that with style, great handling, and reliability. For year round commuting, throw on some studded snow tires and you can handle the worst of New England’s weather. For riding singletrack trails all day long, a pair of knobby mountain bike tires will help you handle the most technical of trails! Come check this one out!